In that Upper Room, an ancient rite began remembering the freedom of the People of Israel, but, ended as the memorial of the new Exodus: our Exodus from death into life, from the slavery to sin into the promised lan d of the Redeemed. Tonight, we are the people who gather in the Upper Room; but the Lamb is the One who left us the memorial of His death and resurrection in the Eucharist. The unleavened Bread of the Seder. The bread of the journey of freedom, now is the eternal presence of the Lamb who freely gave his Life for us. The wine that was shared there is now the Blood of Christ out poured for us. Whenever the Church gathers here, in the Upper Room of Calvary, the Jesus who died and rose is present in our midst and we do this in His memory. Here we experience the grace of Calvary. Here, the grace that flowed from his pierced side continues to flow into us through the mystery of the lasting Gift; until he comes again. The challenge of the sacrifice of the Upper Room is found in Jesus’s word: “Do this in memory of me.”. This extends beyond the Upper Room into the mission of the Church. The gift of the Eucharist is the grace to live lives of service. To be slaves to others and wash their feet. We cannot limit this to those whose feet are clothed in nice shoes and comfortable. The challenge of the Eucharist is to wash the dirty feet of those who struggle every day, to embrace those who don’t look or act the way we think they “should” act. To love the sinner and saint alike. The Christian is to serve the world; not dominate it. The Christian is let go of pride and looking for a pat on the back and serve in memory of the One who washed feet and embraced a criminal’s death. The mandate of service is to put ourselves at the service of the poor and needy of the world; doing all in memory of Him who died and rose. In the Upper Room of Jerusalem and tonight, the role of the ordained priest is clearly defined. He is to lead the community in service; the ordained priest is to lead the community in washing feet; not of the powerful, but of those who the world throws away. The ordained priest is called to live his life in memory of the one who loved the leper and the outcast, who served the poor and needy. He is, Pope Francis has said: to smell the like the sheep. And this cannot happen in an Upper Room above the people of God; but only by standing with them as a brother and fellow Christian. This community of faith belongs to Jesus; this parish is not mine. We are Christ’s People who have been entrusted with a mission together. I am called to bring Christ to you as a servant; and you to Christ so you can serve. Those feet are washed tonight are a challenge to us all: to serve the world in His name fed by His living presence. We, priest and people, cannot hide in the Upper Room and be comfortable, safe, and warm. Like Jesus who left the Upper Room to die for us; so, we, priest and people, must leave the Upper Room of our comfort and safety and wash the feet of the worldâ€¦even if it means betrayal, suffering, and death itself. “Do this in memory of me”. My brothers and sisters, let us commit ourselves tonight to serve one another and the world. May the greatest among us be the one who washes the feet of others, without looking for praise or a pat on the back and shares the essence of his or her very self, the one who embraces the Cross of others. 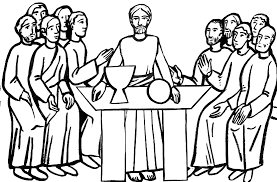 Strengthened by the grace of the Eucharist, may you and I commit ourselves of life to service: may we commit ourselves to “do as He has done”.